Designed to work with the latest generation of computers and smart devices, allowing for reversible plug orientation and faster charging. Comes with merely 2.09 x 2.09 x 1.12 (in) small size but surely supports 30W great power delivery. 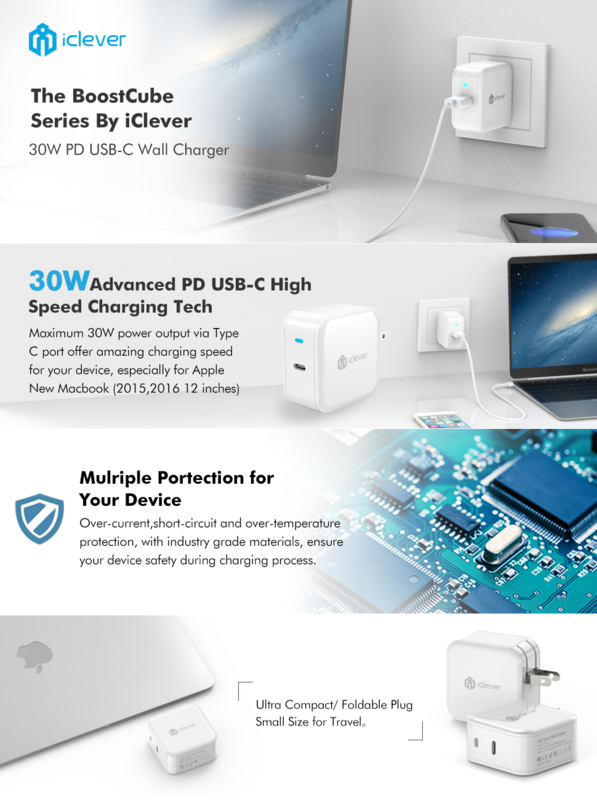 Specially design for charging Apple New MacBook(2015, 12 inches) and other USB Type-C devices (popular models, including Galaxy Note 7, Lumia 950/950XL, Nexus 5X/6p, Note 5, OnePlus 2, LG G5, HTC 10) as well. It’s compatible with standard USB devices(USB Type-C to USB/Mini USB/Micro USB cable needed). I’m currently using this as a charger for my Xs Max and the charge time is nice and quick compared to the small 5w one you get from Apple. Great price, quick charges iPhone XS Max. No complaints, feels well built. I bought it for my Huawei matebook 2016 2-1 pc and works perfectly fine. I'm glad I found a good quality brick for my tablet pc I approve this product and seller. Work as so we'll I bought the two more. Purchased this to upgrade my wireless charger to high speed, and that’s what it did. Had to buy a usb c adapter, and now charging takes half the time (more or less). Works well, durable, worth the money. Satisfied. Packs a punch for a little guy! I’ve tried three different usb-c chargers as of late and this has them all beat! 1) perfect little size for traveling AND the plug folds in for travel convenience! 2) with a usb-c to lighting cable (I use 3rd party), this quick charges an iPhone Xs to 50% in 30 minutes! 3) this holds the usb-c cable firmly in place! With others, the slightest movement of the cable and it came unpluged. With this, the cable locks well into place! 4) how can you go wrong with the price?? For the price, size and power punch, I highly recommend this for anyone looking for a new charger plug!